My husband can tell you that I am a little pizza-obsessed. I pretty much try to talk him into pizza for dinner any chance I get. It’s also a good barometer for if I’m not feeling well. If you offer me pizza and I decline, I am very, very (like maybe gravely) ill. Okay, not gravely ill. That’s a dramatization. You got me. Keeping me honest. That’s you guys. So here’s the thing with this pizza: The crust is made from spaghetti squash. No flour. No butter. Just veggies and cheese, please. If you made spaghetti squash with me last time I posted about this delicious vegetable, then you’ve already had something quite similar. I love spaghetti squash with tomato sauce and cheese, so making a pizza version was just the next logical step. Right? Spaghetti Squash Pizza Crust, makes one large crust. First, carefully cut the squash in half and scoop out the seeds and innards. This part kind of smells like autumn, because it reminds me of carving pumpkins. Lightly coat the inside of the squash in a couple teaspoons of olive oil. Bake at 375°F for about 45 minutes, until the inside is easy to shred with a fork. Allow to cool. Scoop out the insides. Place on a plate or baking dish with paper towels. We want to try and soak up any excess moisture from the squash. First, carefully cut the squash in half and scoop out the seeds and innards. This part kind of smells like autumn, because it reminds me of carving pumpkins. Lightly coat the inside of the squash in a couple teaspoons of olive oil. Bake at 375°F for about 45 minutes, until the inside is easy to shred with a fork. Allow to cool. Scoop out the insides. Place on a plate or baking dish with paper towels. We want to try and soak up any excess moisture from the squash. In a bowl mix together the squash, egg, and spices. Set aside. Preheat the oven, with the baking sheet inside, at 400°F. Once the oven is hot enough, remove the pan, cover with parchment paper, and spread the spaghetti squash mixture over the baking sheet in a thin layer. Bake until the edges begin to brown, around 20-25 minutes. Cover in a little sauce (I used store-bought), cheese, and your favorite toppings. Bake for another 4-6 minutes, until the cheese is nice and melty. I love spaghetti squash and we always have leftovers since one squash is a lot for two people. Thanks for a great idea for the leftovers. This looks so delicious I may have to make it right now…. for breakfast. This is so cool! Looks amazing too! This looks so delicious! Perfect for those times I’m craving pizza but don’t want the bloat. For different flavours, might it be possible to switch up the vegetable base – i.e. maybe using mashed cauliflower? I can not wait to try this! Pasta/Bread can be tough on my tummy, what a great substitute! Mmmm, a healthier pizza! I adore pizza. It is my unhealthy obsession. Give me wine, pizza, and sorbet and I will be happy forever. Thanks for sharing! Yum! Did you know that you can also cook the squash whole and then cut it in half when it’s done. It eliminates that “carefully cut in half” bit…sometimes when they’re raw, they’re a pain in the neck to cut and I’m afraid I might cut myself. Hi… if you poke some holes in the spaghetti squash with a knife or fork, cut off a small bit of the ends and microwave for 5-10 minutes, it will be soft enough to cut with your knife without cutting your hand and fingers off. It depends upon the size of the squash, but i play it by ear. It works every time before i bake it. Best wishes! Cutting a spaghetti squash with a knife is asking for trouble. I keep a dedicated saw in the kitchen for sawing these bad boys in half. Hello, girls! Loved this idea! I always try new recipes that are healthier. I’m from Brazil and really admire your work. Thanks for sharing. Mmm this looks so yummy and healthier than normal pizza! Going to have to try it! You’re writing makes me smile Emma! I am a pizza freak and you usedy favourite toppings.. I have no choice but to make this. I will keep you posted. YUM! I am clearly missing out on spaghetti squash! Mind blown. Can’t wait to try this out. Genius! I always have leftovers so this is a great way to mix it up. I love finding alternatives to traditional crust. Thanks! Looks delicious, but I have a question. Do you scoop the innards out twice? Once before you bake the squash and again afterward. I’ve eaten spaghetti squash but never cooked it before so that’s why I’m confused. Thanks! Yum!! I have been obsessed with Spaghetti squash ever since you posted the first post about it! ; ) I have to convince my husband to let me make this for supper sometime. Or, maybe I’ll make it for lunch sometime! : ) I’m pumped. This sounds so good! I don’t love spaghetti squash as pasta, but I might like it as pizza. Great way to get in an extra veggie! This is perfect for my grain-free diet! I’ve seen pizza recipes with a cauliflower crust but not with squash. Love this and must try! oooohhhh delicious! i wouldn’t even feel bad for eating that pizza all by myself. Lots of love from Munich! Pretty sure spaghetti squash is next to non-existant in Ireland, I’ve wanted to try it for so long! 🙁 such a simple recipe for “healthy junk food” too, maybe I’ll be able to try it some day…! I’m pretty sure that spaghetti squash is next to non-existant in Ireland, I’ve wanted to try it for so long! 🙁 such a simple recipe for “healthy junk food” too, maybe I’ll be able to try it out some time…! I could possibly send you seeds if you cant find spaghetti squash and have a place to grow them. They take all summer, are quite large, running, squash bushes but the squash store well. We grow them and share and enjoy them all winter. I’m soooo going to try this! Right there with you. I love pizza and, honestly, your garlic crust changed my life! I’ve been making it ever since and every.single.person. requested the recipe. I hope there’s spaghetti squash at the farmer’s market tomorrow. Love this post! Can’t wait to try this! I’m the same with coffee. If I ever decline a coffee – chances are I’m just shy of death! I understand you, I’m a pizza-obssesed as well! This one looks so good ! have a nice weekend!! I’m always looking for healthy alternatives for some of my not-so-healthy favourite meals and will definitely be giving this one a try! This looks awesome! I’m also crazy about pizza so I’ll have to give this unusual version a try sometime! ooh, interesting with the squash crust. will try it! looks yum! This looks INCREDIBLE. Am trying this on the weekend. mmmm! delicious! thanks for share this recipe! wonderful! Omg yes please! I love cauli crust but this seems easier. Have you ever tried sweet potato crust? Would love to try this but they don’t have spaghetti squash where I love :(. Guess there aren’t any substitutes?? I’m still going to bookmark and hope for a chance to try this in the future. This is awesome. I just recently made cauliflower crust; but being vegan it is difficult to get them to hold together without the egg. This is a challenge I may have to take up 🙂 Spaghetti squash crust, yum! Think this might work with an egg sub? I’m allergic! i am making this for dinner TONIGHT! i love this idea so much! thank you so much for helping out the pizza-holics everywhere :D! This looks fantastic, I’ve done cauliflower crust too but it’s more complicated because you have to “rice” the cauliflower to make the crust but the results were delicious. This looks so different but so good. I definitely need to try this one day. Plus it’s healthy which is a plus! wow, what a fantastic idea!!! This looks absolutely delicious! I’ve made cauliflower crust, brown rice crust but never spaghetti squash crust! This sounds soooo amazing. I will need to try it soon! I love putting on broccoli and zucchini with lots of spices! Seriously, that’s for posting this. I love finding alternative GF crusts. Now this is something I definitely have to try! My boyfriend and I are obsessed with pizza. I’ve been looking for healthier versions so we can eat it even more often than we already do! Thanks for the recipe! How is the texture in the middle? This is the most delicious and exciting thing ever! Love the dish! Must share! How awesome! I love the idea of a healthier version of pizza because, I too, am a pizza lover! I can’t wait to try this recipe out! love this. i actually had spaghetti squash last night for dinner (and leftovers for lunch today). cauliflower crust pizza is also bomb. This would be a wonderful recipe for Daniel Fasters…Sounds great! SUCH a spot-on idea. love this, emma! wow, sounds like the perfect healthy alternative to ordering pizza! love this! Love this! I just made a zucchini crust pizza (so good! ), so I’ll have to try this next. So smart to preheat the oven with the baking sheet inside–I never thought of that and will definitely give it a shot! This sounds really delicious. I will be trying this soon. This pizza looks really good! I have started following your blog after seeing this photo!!! as an avid lover of spaghetti squash and pizza, you can guarantee i’ll be making this sometime next week. you are a freaking genius. I think all of my gluten free dreams just came true. This was the perfect time for you to post this recipe because my boyfriend would probably never agree to trying this dish, but he just left for the whole weekend. MUAHAHAHA. Spaghetti squash pizza for this girl tonight! 🙂 Thanks for the recipe!!! Legitimately decided to make this for dinner last night the moment I saw it. It was delicious!! Thanks for the inspiration. This looks amazingly delicious. Did you use slices of fresh mozzarella in this recipe? Trying this for dinner tonight! Thanks for the inspiration! I’ve done cauliflower crust a few times and recently saw a recipe for chickpea crust but haven’t seen spaghetti squssh! Fun use. This looks so healthy and so yum! 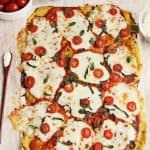 I usually try to go for some gluten-free or whole wheat crust but this is so creative and it actually looks delicious! I love spaghetti squash, maybe sweet potato mixed in would be good too? Mmm that looks good – it makes me wish we had spaghetti squash in England! I’ve made a similar crust out of shredded zucchini but never thought of spaghetti squash! This would be perfect for the leftover spaghetti squash that I always end up with since there is NO way I can eat a whole squash in one setting! Big yum to this! I LOVE pizza!! I’m so obsessed with spaghetti squash, so this is right up my ally. I’m no doubt going to make this. I currently happen to have two spaghetti squashes sitting on my counter awaiting a new lovely creation. BINGO! I just found it. Thank you so much for sharing this! oh. em. gee. This looks amazingly delicious…and healthy. Best combo ever. good idea for a more healthy version of my favourite! This looks delicious. Awesome idea. I love spaghetti squash and pizza. So, I was super excited to make this recipe last night and find it was supper yummy! I finally got to try out this recipe today (it took me a little while to find spaghetti squash!). It was delicious BUT my crust came out a bit soggy. Emma, could you tell me what I might have done wrong? Maybe I didn’t drain the excess moisture enough? Also, do you think that baking it a little longer (before adding sauce/toppings) might help? I’m determined to try again…the flavor was right on, I just need to perfect the texture! The combo of spaghetti squash and pizza was a revelation to me! Holy moly. I just tried this for dinner (veganized) and loved it. Thanks for sharing! I cooked my squash and left it in the refrigerator lightly covered for a few days. I then left it in a colander in the sink for about 20 minutes. When adding the egg I also added parmesan cheese and spread it as thin as I could and baked it before adding toppings. It was great. I did not miss the crust at all. Can’t wait to make it again. Tried this for the first time. Cooked squash, squeezes out liquid for 30 min. Put I fridge until got home from work. Squished out almost a cup of more liquid. Who knew. Anyway then mixed with egg and went from there but used silicon sheet. 400 for 20 min, flipped sheet around, cooked for 10 min more. Pulled pan out and turned over. Baked for 20 min more. Topped with sauce, pepperoni and cheese. Very limp pizza, ate with fork. Awesome flavor, will make again.